Whether you're looking to do some shelling, swimming, snorkeling, kayaking, or just work on your tan, Sanibel and Captiva Island offer some of the best beaches in the world, and with over 15 miles of unspoiled beaches, there's a beach for everyone! Of course, while staying at Sea Shells of Sanibel, all of this is right in your own backyard! A sunrise or sunset on Sanibel and Captiva's beaches is an experience that can't be missed and Seashells of Sanibels Condomiums has its own private access to this beach you see on the right. Here is a list of beaches you'll find on Sanibel and Captiva Islands. Causeway Beaches: As you make your way from Fort Myers to Sanibel Island, you can't help but cross the causeway bridge connecting Sanibel Island to the mainland. On both sides of the causeway, you'll find beaches suitable for swimming, fishing, and on especially windy days, windsurfing! Lighthouse Beach: Located on the east end of Sanibel Island, this where you'll find the historic 1800s lighthouse. Gulfside City Park: A good place to stop for a picnic, since there are picnic tables along side the native vegetation. Located mid-island on Algiers Lane, just off of Casa Ybel Rd. Tarpon Bay Beach: Located mid-island at the south end of Tarpon Bay Road at West Gulf Drive. Bowman's Beach: If you're looking to kick back and relax on a quiet beach with no hotels, this is the beach for you! This is also a great spot for a barbecue lunch at the beach, as this is the only beach with barbecue grills. Located off Sanibel-Captiva Road on Bowman's Beach Road. Turner Beach: A magnificent beach for shelling and fishing, but not recommended for swimming because of its strong currents. 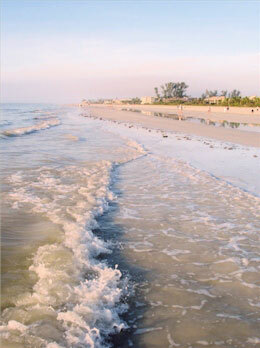 This beach is located on Sanibel-Captiva Road at the Blind Pass Bridge. Captiva Beach: An awesome spot for viewing sunsets on Captiva Island. Located at the end of Captiva Drive.